Everyone has a grilling enthusiast in their family or friend circle, and most of the time it’s quite difficult to decide what the best gifts for grilling enthusiasts are. Because we have faced this problem on multiple occasions, is why we decided to compile a list of the best gifts for grilling enthusiasts. Because if you’re anything like us, you prefer to get your friends something that they’ll actually like instead of something they just exchange for store credit. Gift for Grilling Enthusiasts #1. The Lava Tools PT12 Javelin Digital Thermometer provides instant results; it has an assessing time of two seconds after which it provides you with the reading. This thermometer is small and compact; it is foldable which reduces its size even further. It is customizable to provide readings in both Celsius and Fahrenheit. Another feature is its ability to turn off if the probe is closed or after an hour’s inactivity. This helps to conserve battery and make it last longer. It has great performance and is hand-held which makes it one of the best gifts for grilling enthusiasts. The Lava Tools PT12 Javelin Digital Thermometer has a small probe that is usually ideal unless making a large roast. This means that you can’t easily record the internal temperature of the roast. The absence of a backlight means that it is very difficult to use without an external light source present. The Lava Tools PT12 Javelin Digital Thermometer has an ambidextrous design that allows you to hold it whatever way is most convenient for you. Has a small body and probe that force you to get close to the food and increases the risk of burns. Gift for Grilling Enthusiasts #2. The Western 78075 Hickory BBQ Smoking Chips are used to add the much-desired flavor of wood smoke mainly. These can be added to any kind of food while cooking, be it vegetables or any kind of meat. Not only that, these chips don’t restrict you to cooking only on the grill. Instead, these can be used when cooking on gas, charcoal grill or any other kind of grill or smoker. This gives your food the strong, authentic taste of a southern roast. It produces best results when cooking poultry, beef and seafood because it causes the meat to absorb the distinct and delicious woody flavor. They can be used when preparing smoked apples. The Western 78075 Hickory BBQ Smoking Chips are one of the best gifts for grilling enthusiasts in the family. Not only does this make the receiver of the gift happy, but instead, you get to enjoy them too when they’re used. How can it get any better? Gift for Grilling Enthusiasts #3. The skewers are perfect for the easy loading and removing of your desired meats with absolute ease. Once arranged as you wish, you can lower them into the cooker to prepare the perfect kebobs. You can use vegetables or chicken, beef, mutton or seafood, and it’s always delicious. All the accessories allow you to cook larger quantities of food at the same time so that you can roll it out all at once. The leg racks have been designed especially for convenience. This is an especially best gift for grilling enthusiast friends who host a fair number of BBQs because it makes their life much easier. All the accessories are made of standard or wire steel and can be cleaned safely in the dishwasher. The accessories allow large amounts of food to be prepared in minimal amounts of time. Gift for Grilling Enthusiasts #4. The Looftlighter Charcoal Starter is an incredible device that just may be one of the best gifts for grilling enthusiasts. We are all aware of the painstaking process of starting the charcoal when grilling over it. Everyone knows it takes forever, and even then the even spread of the heat might take even longer. The Looftlighter Charcoal Starter is the solution to all those problems. It is incredibly safe and easy to use. All it takes to get your charcoal glowing a bright cherry red is to plug it in and then hold it to the charcoal until it’s all red and pretty. After this, you can use the fan to start the rest of the coals. This allows for starting of coals over a large area, and so they heat evenly. This can ignite anything from wood to coal without the need for any kind of accelerant. It is environment-friendly and more than that; it keeps your food free of any toxic fumes. This helps to keep any foreign chemicals altering the natural flavor of your food. Gift for Grilling Enthusiasts #5. The Cave Tools Smoker Box for Grill Wood Chips is a nifty little box that gets you all the delicious bittersweet taste of the wood chips slowly and steadily. This means that instead of the large amounts of smoke that are usually produced all at once, the Cave Tools Smoker Box for Grill Smoker allows for a slow release of the smoke. This allows for deep absorption of the smoke by the meat that is being cooked so that you can taste the flavor of the wood chips not only in the most superficial layer but even deeper into the meat. It’s incredibly easy to move around so that they can situate it in an adequate position for maximum taste. The Smoker Box can be used to mix different kinds of chips, and this can allow them to experiment with different flavors. The box also allows for the more efficient use of the chips, and so fewer chips are utilized during each session than used previously. Since the bottom of the box has no holes, the chips do not come into contact with the grill, and this means that there are no temperature fluctuations which allows for even cooking of all the meats. Not suitable for when cooking for a small number of people. Gift for Grilling Enthusiasts #6. The Charcoal Companion has been designed for use with a gas grill. 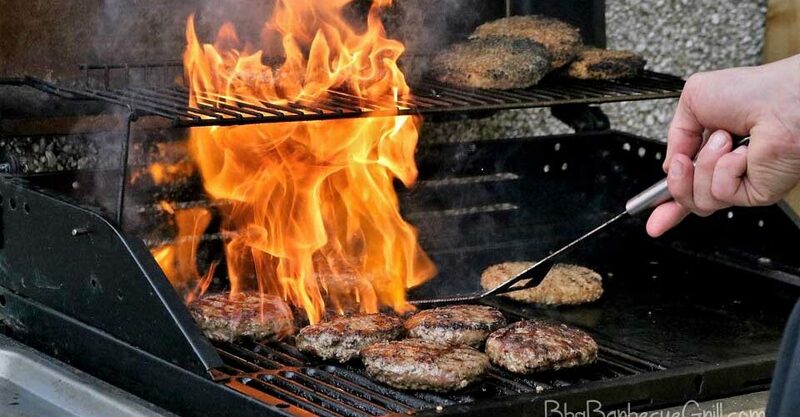 Gas grills are usually the most convenient way of grilling, but this means the loss of the Smokey flavor. Not anymore. What makes Stainless Steel V-Shaped Box one of the best gifts for grilling enthusiasts is the way it combines convenience without compromising on flavor. You can grill your food on the gas grill and while doing so, place the V-Shaped Smoker Box between the flame deflector bars that are present in most gas grills. This produces a steady stream of smoke from the box which is absorbed by the meat. This gives the meat the distinct Smokey charcoal flavor that is usually lacking in food cooked on a gas grill. Not only that, it is incredibly easy to use, it is reusable, and allows for experimentation with chips of a different flavor to get the perfect combination. The box has a hinged lid for the easiest access, and the Charcoal Companion Stainless Steel V-Shaped Smoker Box is quite durable. Gift for Grilling Enthusiasts #7. The Bruella BBQ Spiderman Grill Gloves have been made with military grade Kevlar that allows you to grill fearlessly. The Bruella BBQ Spiderman Grill Gloves are approved for temperatures of up to 932°F; this heat-resistant property allows the user to grill without fear of any burns. The Bruella BBQ Spiderman Grill Gloves don’t call for any compromise on the dexterity of fingers. This means that you can do anything that would require finger manipulation while wearing them, unlike other grill gloves that don’t even allow you to open a beer can without having to take them off. It has an internal web of silicone that prevents slippage and gives the user a firmer grip on anything and everything. What makes the Bruella BBQ Spiderman Grill Gloves one of the best gifts for grilling enthusiasts is the relatively longer arm length of the glove, this means the user will no longer have burns on their forearms. Not only does it fit large hands, but it also fits small hands if shrunk just right. They can be shrunk after being washed with hot water and then dried on high heat for about an hour. Gift for Grilling Enthusiasts #8. The Uuni 3 Portable Wood Pellet Pizza Oven is the perfect addition to an outdoor kitchen. The technology utilized in making this oven makes it hassle free and one of the best gifts for grilling enthusiasts. The oven works on wood pellets. This provides you with the best possible use of energy. Wood pellets allow for the fastest heating of the oven to an incredible 942°F in just about 10 minutes. The insulated body of the oven increases its efficiency because it helps to limit the heat losses that usually cause losses of energy. This Uuni 3 Portable Wood Pellet Pizza Oven allows you to cook food at a much greater, it can fully cook a pizza within 60 seconds. This makes it the perfect must have for anyone who loves outdoor cooking. It is also great for use in parties, and large get together, where you need large amounts of food in small amounts of time. It is powered by wood which is easily and cheaply available. The Uuni 3 Portable Wood Pellet Pizza Oven is incredibly reliable and can last for years. Gift for Grilling Enthusiasts #9. The Wing and Leg Rack from Cave Tools can fit up to 12 wings, thighs, legs, or drumsticks when cooking on the smoker or the grill. The Cave Tools Chicken Wing and Leg Rack have the added advantage of being completely dishwasher safe. This means that it is very easy to clean, so you don’t have to fret about sticky grease stains and to get them out. The thing that makes the Cave Tools Chicken Wing and Leg Rack one of the best gifts for the grilling enthusiasts in your life is the locking mechanism it provides for the vertical racks. This is incredibly useful because it locks the stand and prevents it from collapsing while the chicken is cooking. It also has a very deep drip pan that allows you to collect all the drippings. This is great if you want a chicken base for your sauces or for preparing vegetables in that base. The drippings are also very useful if the user wants to make soup or gravy, the dripping provides a unique smoky and juicy taste to anything you add it to. Gift for Grilling Enthusiasts #10. The Rib-o-Lator Rotisserie Adjustable Trays consist of four trays that are able to attach to the rotisserie not only that, the trays can also rotate. It has flat surfaces that allow you to cook just about anything on them, anything from vegetables to all kinds of meats. The trays are stainless steel that is 100% dishwasher safe. This makes them incredibly easy to clean. It is very easy to set up. Gas grills usually have an entire mechanism for the setup, but if you are using a charcoal grill, you will have to do a little more work. If using a charcoal grill, the user needs to get the grill going before placing the trays on the grill unlike with the gas grill. This is the perfect way of cooking items that don’t require direct heat but in fact cook best at low heats for comparatively long periods of time. Now that we have described all the candidates, it is time to pick the winner. We think that one of the best gifts for grilling enthusiasts is the Bruella BBQ Spiderman Grill Gloves. This is because they are quite festive and just about everyone needs grilling gloves. Moreover, it doesn’t matter what type of grill anyone prefers, a great set of grilling gloves is a must have for everyone. While the other products in the list above helps to enhance the flavor, the Bruella BBQ Spiderman Grill Gloves work to enhance the grilling experience and allow you to enjoy the grilling and cooking to the absolute fullest. It keeps the user from forearm burns and safety is no joke. And what will be the best gifts for grilling enthusiasts in 2020? If you are interested in this subject subscribe us and share your opinion in a comment. Thank you! ← What is the Best Hamilton Beach Electric Grill in 2018-2019?